We all know that we can’t have sleep studies without our patients. And we also know that patients come to our centers through our physicians. So, what causes the physician to send a patient to one sleep center versus another? Let’s look at that a little more in detail. There are many factors that may contribute to a physician’s or a patient’s decision to go to one sleep facility or another. It could be better service. It could be better care. It could be better information. It could be a better relationship. It could be brand equity. The truth is there could be any number of reasons a patient may insist on going to a specific sleep center or a physician may choose to send them to. So, how does this link with social media? Social media engages the consumer at the levels described above: service, care, information, relationships and brand equity, among other things. But before we talk about this, let’s look at social media in greater detail. If you’ve used any form of social media, you’ve probably built a virtual network or community of friends or like-minded people. When using social media for business, it’s a very similar concept of building a community. You have to build your community and reach out to them. In the rest of this article from the Q4 2018 issue of A2Zzz, Gerald George Mannikarote provides more social media tips. This article is one of four designated CEC articles in this issue of A2Zzz. 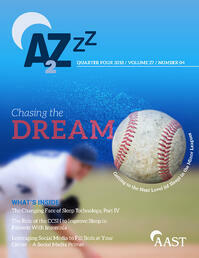 AAST members who read A2Zzz and claim their credits online by the deadline can earn 2.00 AAST Continuing Education Credits (CECs) per issue – for up to 8.00 AAST CECs per year. AAST CECs are accepted by the Board of Registered Polysomnographic Technologists (BRPT) and the American Board of Sleep Medicine (ABSM). To earn AAST CECs, carefully read the four designated CEC articles and claim your credits online. You must go online to claim your credits by the deadline of March 1, 2019. After the successful completion of this educational activity, your certificates will be available in the My CEC Portal acknowledging the credits earned.